Experience Salt Lake City at Salt Lake Marriott Downtown at City Creek. Located in the heart of downtown, our City Creek Center hotel offers superior services and amenities for every traveler. Settle into the gracious rooms of our family-friendly hotel, featuring beautiful city views. Dine in our popular restaurant, Elevations, featuring our chef's delicious, locally-sourced creations, meet for drinks in Destinations Lounge or grab a cup of Starbucks for a quick pick-me-up. Our 24-hour fitness center lets you workout on your own schedule, or you can go for a dip in the indoor/outdoor pool. 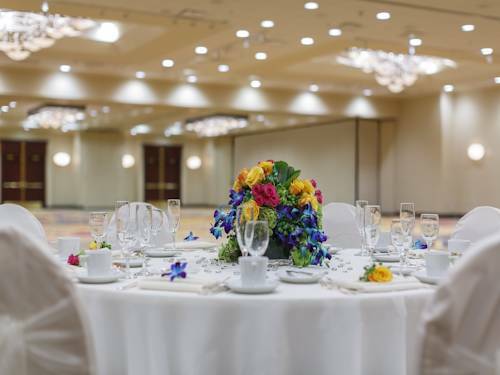 Our versatile venues are ideal for every event, from business meetings to social galas and weddings. When it's time to explore, you'll discover some of Salt Lake City's most famous attractions nearby, including Temple Square, Salt Palace Convention Center, University of Utah and high-end shopping at City Creek. Whether visiting for work or vacation, we look forward to welcoming you to our downtown Salt Lake City hotel. Elevations: Savor classic American cuisine updated with Utah's bold flavors in our welcoming downtown restaurant. The ski-lodge ambiance creates a relaxing setting, ideal for starting your day over a hearty breakfast, meeting with clients or catching up with family. Destinations Lounge: Gather with friends in our casual lounge, the perfect spot to meet after a busy day in Salt Lake City. Sample our selection of craft brews, or sip one of our innovative cocktails while dining on our eclectic menu of shareable small bites. Starbucks : Stop by Starbucks , conveniently located in our downtown hotel, for your favorite coffee drink and treats. Grab a coffee on your way to shopping at City Creek, next door, or as you head to a busy day at the Salt Palace Convention Center.